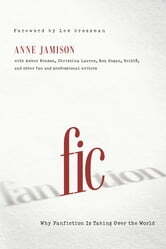 Fic is a groundbreaking exploration of the history and culture of fan writing and what it means for the way we think about reading, writing, and authorship. It’s a story about literature, community, and technology-about what stories are being told, who’s telling them, how, and why. With provocative discussions from both professional and fan writers, on subjects from Star Trek to The X-Files and Buffy the Vampire Slayer to Harry Potter, Twilight, and beyond, Fic sheds light on the widely misunderstood world(s) of fanfiction-not only how fanfiction is transforming the literary landscape, but how it already has. Fic features a foreword by Lev Grossman (author of The Magicians) and interviews with Jonathan Lethem, Doug Wright, Eurydice (Vivien Dean), and Katie Forsythe/wordstrings.